The Philippian Jailer: Whose Revival Is It? News flash: Something is wrong with the church! So then, can we agree on that? Good. But what exactly is wrong, and what do we do about it? Well, this is where consensus among the faithful ends. It's not that there are no answers, but rather that there are so many answers. 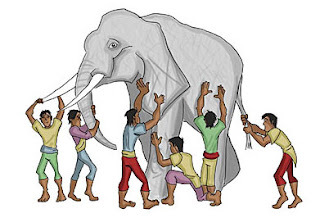 In some senses, the discord resembles the well-known metaphor of the blind men and the elephant, where each man "sees" a mere part of the whole, and draws broad conclusions based on a limited perspective. To the missional evangelist, the problem is clearly one of widespread disobedience to the Great Commission. To the orthodox theologian, we have abandoned serious study of Scriptural truth. To the socially conscious, we have neglected justice and indulged in our comfortable Western opulence. To the maverick, we have allowed our traditions to blind us to God's Word and dynamic direction. To the conservative, we have abandoned many healthy, godly traditions in our rush to be "relevant", and thus thrown out the baby with the bathwater. To the prayer warrior, the answer is that we've simply neglected to unleash God's saving power through focused petition. And so on (feel free to add your own). Of course, none of these diagnoses is necessary incorrect, nor is any of them complete. There is likewise a temptation to arrogantly savage the organized church without issuing--or better yet, living out--any higher calling. In many cases, the self-righteous rejection of the organized church serves as little more than a cover-up for sin. Freed from the "oppression" of the church (or should I say the accountability to the church), there is often a descent into sloth. This is not a spiritual revolution ... it is a temper tantrum. Ideally, this realization should leave us humbled, but hopeful. Somehow each of us needs to maintain our ardor for our particular calling, without then getting lost in our own hype. Yet this can be extraordinarily difficult, in part because we are so limited and sinful, and in part because we are so poor at recognizing how limited and sinful we are. In words and theory, Jesus and justice are a package deal, but in my heart and in my actions, I've picked up justice and dropped Jesus, slowly but steadily. Almost ANY movement can get us off track, because of the temptation to replace the BEST with the merely GOOD; to treat one of the King's concerns as superior to all others ... even more important than exalting the King Himself. Meanwhile, we judge those who do not share our level of excitement or outrage for our particular calling, neglecting the notion that God may have given them a different calling. In other words, there's no endeavor--even the outwardly spiritual ones--which we sinners cannot corrupt. This gets us to the heart of the problem--our selfish proclivity for idolizing our own ideology. We discover a truth and decide it is THE truth. Somewhere along the line we neglect to consider that we don't get to choose the precise terms of God's reforming work. Biblical and church history demonstrate that it is never too late to pray for revival to come in our time. Of course, Scripture teaches that nothing short of the consummating work of the Savior Himself will be sufficient to save the church or the world utterly from the devastating consequences of sin's corruption. In the meantime, there is much hard work to be done, and fratricide is unlikely to help things along. There are very few streams where we can go today for a drink of fresh water...pure, delicious, and sparkling clear. Water that flows freely, clearly and unmistakably from the direction of Christ, the water of life. But that's exactly what I find every time I visit your site. Thanks for another suburb analysis of a problem that is infecting us all. I think these words of yours summarize it perfectly "Ideally, this realization should leave us humbled, but hopeful. Somehow each of us needs to maintain our ardor for our particular calling, without then getting lost in our own hype. Yet this can be extraordinarily difficult, in part because we are so limited and sinful, and in part because we are so poor at recognizing how limited and sinful we are." God deliver us from our oh-so-limited and sinful selves. Thanks again Jailer. Great job. Excellent overview of the current "I'm right - you're wrong" error in the church of Christ. Perennial arguments over faith-works, election vs. free will, and competing theories of Rapture have a common genesis in the errant belief that any human can know God's mind or Word exhaustively. Anger, emotion, and outrage boil over with accusations of heresy should others fail to interpret symbolic and prophetic parts of the Bible in the same way as a "learned one." Common foundations of faith in Jesus Christ support the entire body and scribe the outlines of each individual's walk with Him. Then we get into the quicksand of disputes over specifics that Satan uses to divide us. There is ALWAYS one more piece of the puzzle we don't know. 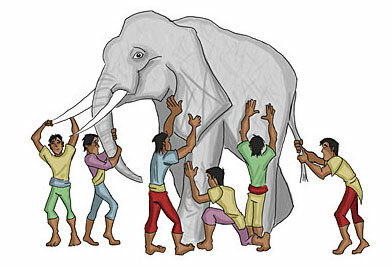 Spirit-directed ministries are sent to deal with a particular part of the "elephant." If all had the same conviction to scrub the pachyderm's toenails the animal itself would die of starvation, but with a great manicure. We need to keep our eyes on Jesus. We need to ask the Holy Spirit to guide us as individuals and as congregations. We need that Holy Spirit to fall on ALL our institutions-churches, government and individual homes. Thanks Earl. Those are very kind words, and very encouraging! Great truth. Thanks for the shout out!